West façade of the Supreme Court Building. JUSTICE KENNEDY announced the judgment of the Court and delivered the opinion of the Court with respect to Parts II–A and III, an opinion with respect to Parts I and IV, in which THE CHIEF JUSTICE [Roberts] and JUSTICE ALITO join, an opinion with respect to Parts II–B and II–C, and an opinion with respect to Part II–D, in which JUSTICE Roberts SOUTER and JUSTICE GINSBURG join. In addition to Justice Anthony Kennedy’s opinion, which was partly also the opinion of the court—and partly not—his colleagues managed to produce a total of five separate opinions which both agreed and disagreed with Kennedy. Good luck to lower court judges and lawyers trying to pick through the wreckage to try to decide which parts the court actually decided and which were just arguments among justices. The conventional wisdom is that Justice Kennedy will decide whether Wisconsin’s gerrymander lives or dies. This reflects the widespread assumption that the rest of the court is evenly split between four justices who hate gerrymanders and will vote to kill Wisconsin’s version (generally called the “liberals”) and four who are generally fine with gerrymanders, or at least unfine with court interference with them (generally called the “conservatives”). Despite his discomfort, however, Kennedy has yet to vote against a partisan gerrymander. In each of the cases decided he rejected the proposed standards and voted to allow the gerrymander. … no judicially discernible and manageable standards for adjudicating political gerrymandering claims have emerged. Lacking them, we must conclude that political gerrymandering claims are nonjusticiable … Eighteen years of essentially pointless litigation have persuaded us that Bandemer [a 1986 decision] is incapable of principled application. We would therefore overrule that case, and decline to adjudicate these political gerrymandering claims. First, his was one of five votes for a stay on the district court’s order that the Wisconsin legislature come up with new districts. There is a final, often-unstated danger where race and politics correlate: that the federal courts will be transformed into weapons of political warfare. Unless courts “exercise extraordinary caution” in distinguishing racebased redistricting from politics-based redistricting, … they will invite the losers in the redistricting process to seek to obtain in court what they could not achieve in the political arena. If the majority party draws districts to favor itself, the minority party can deny the majority its political victory by prevailing on a racial gerrymandering claim. Even if the minority party loses in court, it can exact a heavy price by using the judicial process to engage in political trench warfare for years on end. I would argue that factual evidence should infuse decision-making, and from that perspective, reading Supreme Court decisions can be disturbing. There is a certain intellectual arrogance in believing that because the court has not found a standard that meets its expectations, no such standards can ever be found. Too often assertions are made without bothering to discover whether the evidence backs them up. Why has the Supreme Court been so unable to effectively grapple with gerrymandering for political advantage? Compared to many other questions that courts considered (whether a shooting is self-defense, for instance), the issues seem relatively simple: were those in charge motivated to favor one party over another, is the result seriously asymmetric, and would other plans serve the same legitimate goals while being less biased? Moreover, to think that majority status in statewide races establishes majority status for district contests, one would have to believe that the only factor determining voting behavior at all levels is political affiliation. That is assuredly not true. 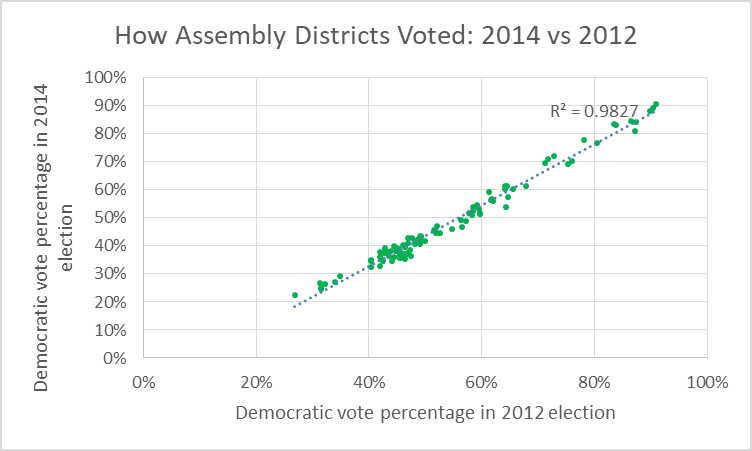 Now compare the vote by Assembly district for president in 2012 and that for governor in 2014. Political affiliation, if not the only factor, is by far the most important factor determining voting behavior. The following chart compares each district’s per cent Democratic vote in 2012 with its vote in 2014. Even the 2016 presidential votes follows this pattern. Despite all the former Obama voters who switched to Trump and the suburban Republicans turned off by Trump’s thuggery, the 2012 results do an overwhelming job of predicting district votes in 2016. The correlation falls only from .99 to .94. While political affiliation is not the only factor determining voting behavior at all levels, it comes very, very close. A second theme that runs through the opinions is a belief in the need for a single formula for measuring partisan bias, one that can be universally applied. In truth, there are a variety of tests for gerrymandering. Rather than a weakness the variety is a strength. They can be used to check each other. If, for some reason, one doesn’t fit others are available. For example the mean and median. The mean number of Republicans in a Wisconsin Assembly district is calculated by adding up the number of Republicans in each district and dividing that total by the number of districts. The median is found by arranging the districts in order, from smallest percentage of Republicans to largest and taking the value of the one in the middle. If a distribution is symmetric, the mean and median will be approximately the same. The aim of gerrymandering, of course, is to make the distribution of districts asymmetric to favor one party over the other. The way to do this is to “pack” many of the other party’s voters in a few districts while spreading the remainder over a large number of districts where they will be safely in the minority. 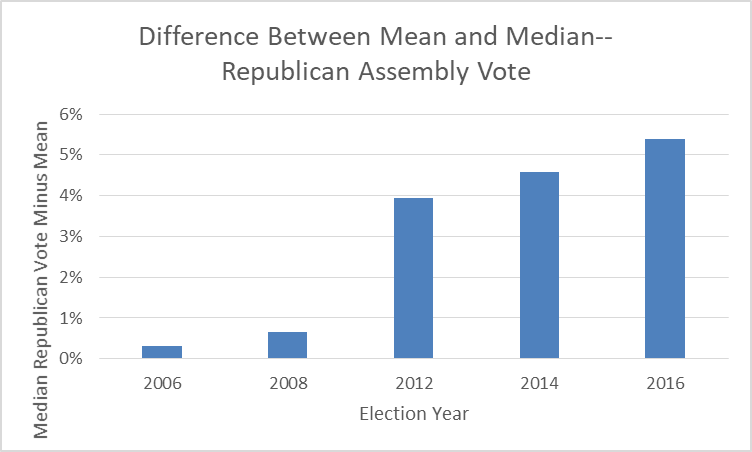 The following graph shows the median minus the mean of the Republican assembly vote before and after Republicans redistricted the assembly in 2010. 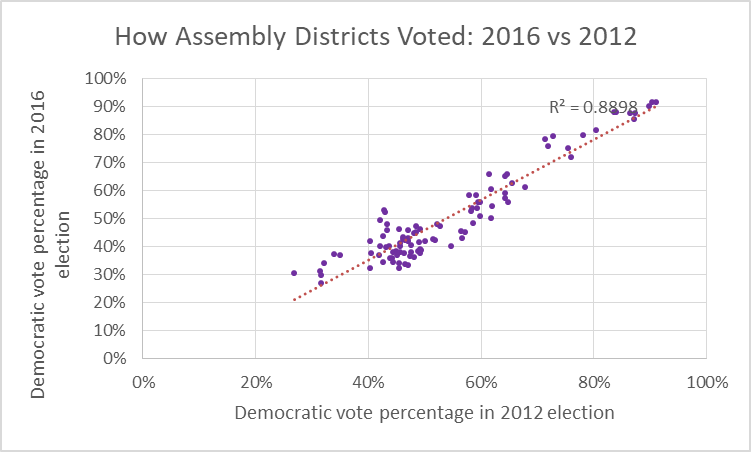 As the graph shows, the median-mean difference took a large jump following the gerrymander, reflecting its use of cracking and packing. 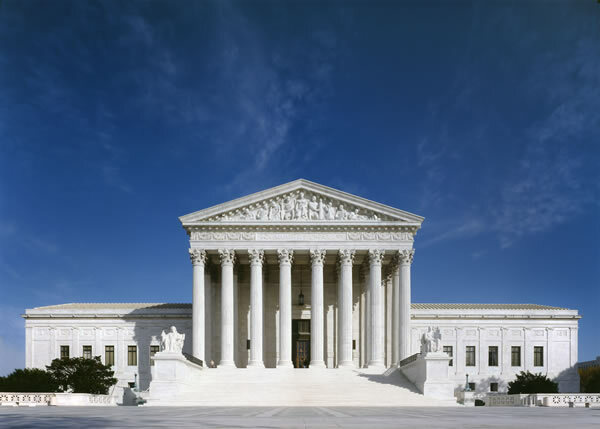 Rather than try to come up with a formula that it can hand down to the district court, the Supreme Court could allow the district courts to determine on a case-by-case basis whether a redistricting plan was aimed at gaining partisan advantage, whether it succeeded in doing so, whether the advantage was durable, and whether the plan was the result of legitimate policy goals.